(Nanowerk News) A rare encounter between two gas-rich galaxies spotted by ESA’s Herschel space observatory indicates a solution to an outstanding problem: how did massive, passive galaxies form in the early Universe? Most large galaxies fall into one of two major categories: spirals like our own Milky Way that are full of gas and actively forming stars, or gas-poor ellipticals, populated by old cool red stars and showing few signs of ongoing star formation. It was long assumed that the large elliptical galaxies seen in the Universe today built up gradually over time via the gravitational acquisition of many small dwarf galaxies. The theory held that the gas in those galaxies would gradually be converted into cool, low-mass stars, so that by today they would have exhausted all of their star-forming material, leaving them ‘red and dead’. 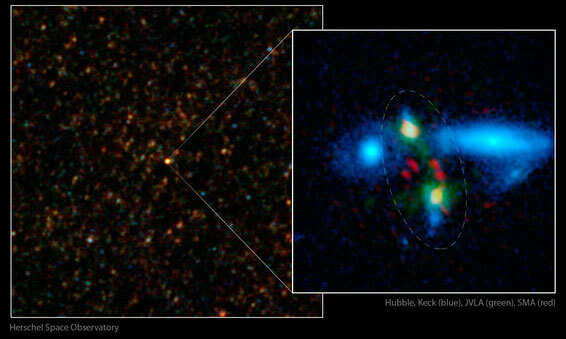 Massive galaxy merger caught in the act. So the discovery in the last decade that very massive elliptical galaxies had managed to form during just the first 3–4 billion years of the Universe’s history posed something of a conundrum. Somehow, on short cosmological timescales, these galaxies had rapidly assembled vast quantities of stars and then ‘switched off’. One idea is that two spiral galaxies might collide and merge to produce a vast elliptical galaxy, with the collision triggering such a massive burst of star formation that it would rapidly deplete the gas reservoir. In a new study using Herschel data, astronomers have captured the onset of this process between two massive galaxies, seen when the Universe was just 3 billion years old. The galaxy pair was initially identified in the Herschel data as a single bright source, named HXMM01. Follow-up observations showed that it is in fact two galaxies, each boasting a stellar mass equal to about 100 billion Suns and an equivalent amount of gas. The galaxies are linked by bridge of gas, indicating that they are merging. “This monster system of interacting galaxies is the most efficient star-forming factory ever found in the Universe at a time when it was only 3 billion years old,” says Hai Fu from University of California, Irvine, USA, who led the study published in Nature ("The rapid assembly of an elliptical galaxy of 400 billion solar masses at a redshift of 2.3"). “The HXMM01 system is unusual not only because of its high mass and intense star-forming activity, but also because it exposes a crucial, intermediate step of the merging process, providing valuable insight that will help us constrain models for the formation and evolution of galaxies,” adds co-author Asantha Cooray, also from University of California, Irvine. The onset of the merger has sparked a star-formation frenzy, with the system spawning stars at a phenomenal rate equivalent to roughly 2000 stars like the Sun every year. By comparison, a galaxy like the Milky Way today only manages to produce the equivalent of one Sun-like star per year. Furthermore, the efficiency with which gas is being converted into stars is around ten times higher than that seen in more normal galaxies, which form stars at much slower rates. Such a high star-formation rate is not sustainable, however, and the gas reservoir contained in the HXMM01 system will be quickly exhausted, quenching further star formation and leading to an aging population of low-mass, cool, red stars. Dr Fu’s team estimate that it will take about 200 million years to convert all the gas into stars, with the merging process completed within a billion years. The final product will be a massive red and dead elliptical galaxy of about 400 billion solar masses. “We were very lucky to catch this extreme system in such a critical transitional phase. It shows that the merger of gas-rich and actively star-forming galaxies is a possible mechanism to form the most massive ellipticals that are observed in the young Universe,” says Seb Oliver from University of Sussex, UK, and Principal Investigator for the HerMES Key Programme, within which the data have been collected. “This discovery highlights the importance of the vast sky-scanning surveys that were completed with Herschel. In this case, the exceptional source HXMM01 was revealed, which may point to a solution of the riddle of how very massive galaxies formed and evolved when the Universe was still young,” adds Göran Pilbratt, ESA’s Herschel Project Scientist.